Why the 3500 foot elevation rule for camping in the Adirondacks? Does DEC give a reason for restricting at-large (unofficial) camping to below 3500 feet? I understand that they wouldn't want people camping near fragile alpine areas - but those are more than a thousand feet above that limit. I doubt that there is any good specific reason not to allow camping at least up to 4000 feet. I suspect that the purpose of the rule is to reduce pressure on the park by just being restrictive, making it hard to camp in desirable locations, thereby making camping less attractive and less popular. It seems misguided to me, however. Campers make up a rather small part of the pressure on the High Peaks, and "at large" campers make up a very small part of the traffic. I believe alpine vegetation is stated as a reason. I do not believe the rule applies in winter, so you could always go then!
! !Use is excessively concentrated in the eastern High Peaks as contrasted to other segments.
! !Summit trampling and erosion was severe due to high concentrations of hikers.
! !Most of the pressure on the eastern High Peaks comes from campers rather than day hikers.
! !Group use, e.g. groups of 10 or more, cause more impact than smaller groups.
! !Camping needs to be commensurate with an area's carrying capacity.
! !Camping should be prohibited above 4,000 feet in elevation.
! !Winter use is increasing; a high number of winter users are inexperienced and ill equipped; the DEC should respond accordingly.
! !Visitors are required to carry out all refuse, trash, garbage, litter, or any other offensive material.
! !All open fires are prohibited above 4,000 feet elevation.
! !Camping is prohibited within 150 feet of any road, trail, spring, stream, pond, or other body of water except at camping areas designated by DEC.
! !Camping permits are required if a location is used four or more nights or if there is a group of 10 persons or more camping in any one location regardless of length of stay. " Have you expended more energy on your hypothesis than 15 concerned citizens working 3 years to deal with the overuse problems? The UMP also details effects of overuse on campsites and trails. One conclusion has to do with the long time it takes for vegetation to become reestablished on sites, even at lower elevation. While you may not be impacting alpine vegetation if you are over 3500 feet, you are using an area that suffers much more severe natural stress than the lower elevations (look at the height the spruces attain as you near the alpine zone), so the additional stress placed on an area by campers will be greater than the same activity would cause at lower elevations. Why the need to camp over 3500 feet anyway? (4) erect a tent in a primitive tent site at a distance greater than 15 feet from the official department sign or disk." So the Department is designating sites that have been evaluated to have less environmental impact. Wow! That's some trolling post! From hypothesis to outrageous conclusion in two sentences! The wild popularity of the High Peaks region effectively disproves your 'making camping less attractive and less popular'. Check out the Marcy Dam-Flowed Lands Corridor and the Johns Brook Valley over the next two months to get a taste of just how unpopular camping has become (hint: it hasn't). Conifer forests are dominant at higher elevations in the High Peaks region (with very few exceptions above 3500 feet). They provide no leaf litter to help stabilize soil affected by the impacts of camping. The thin duff wears away and eventually you get a muddy patch (where no one wants to pitch their tent and so they camp off to the side and expand the problem area). Terrain above 3500 is typically rugged and steeply sloped thereby making it challenging to find a good camping spot … and makes lazy campers choose established illegal sites located less than 150 feet of trails and water. The simplest way to protect the resource (in this very popular area) is to restrict primitive-camping to below 3500 feet (except in winter). There are three notable exceptions where designated campsites are located above 3500 feet (but below 4000): Lake Arnold, Sno-Bird, and Lake Marie-Louise. Getting to Sno-Bird and Marie-Louise requires a fair measure of effort and so they don't see nearly as much traffic as, say, Marcy Dam. One group camped in a non-designated spot (they knew it and didn't care). Another built a fire (forbidden in the EHPWA). A third group was hanging food in a tree (also forbidden) because "it didn't fit in the canister". Lastly, no one took ownership of the pile of feces in their midst. Why bring this up? Because of Kevin7's claim that "Campers make up a rather small part of the pressure on the High Peaks". Here's my take: campers are just day-hikers with additional demands on the resource. They do all the same things I do as a day-hiker plus they need several square yards of land to camp. It's that one seemingly small additional need that, when done the way many incompetent campers do, causes an outsized impact on the land. Look at the DEC's list of regulations for the Eastern High Peaks area. More than half of the list concerns itself with camping directly and indirectly (campfires, bears, etc). It's often done badly so all sorts of constraints must be spelled out to minimize the damage. Nevertheless, it's still done badly and sometimes with full knowledge of being in violation. Which brings us to the next phase. The 1999 UMP recommended constraining camping, in the Marcy Dam-Flowed Lands Corridor, exclusively to designated campsites (i.e. no 'free-range' primitive camping). It never came to pass but the latest UMP has resurrected it and I believe it's going to happen this time round. The DEC is moving/rebuilding campsites in the Corridor and that might be a prelude for enacting the UMP's recommendation. Don't like it? Blame it on the incompetent Eastern High Peaks campers who continue to build fires, camp illegally, fail to bring canisters or keep food where they shouldn't, defecate without burying it, and a long list of other bad practices. They didn't bother to learn the right way or simply chose to ignore it. It won't surprise me if, some day in the not too distant future, camping will either be permit-based or even banned in the EHPWA. So, yeah, camping does cause significant impacts on the resource (because of how poorly it's executed by many people). Therefore a litany of regulations are needed to minimize its outsized impacts, including keeping it below 3500 feet (and potentially soon, only to designated campsites in the most travelled areas). Last edited by Trail Boss; 07-05-2018 at 04:14 PM.. So can you setup camp anywhere between 3500 and 4000 during winter?? Not anywhere. You must be at least 150 feet from any trail, body of water or water course, unless at a designated site. No. At-large camping is forbidden at all times between 3500 and 4000 feet in the High Peaks Wilderness Area, as is all camping above 4000 feet. The old exception for the winter months has not applied in the HPWA for close to two decades now. Thanks for the correction! I replied too hastily. I’ve been away, and unable to respond to the many interesting comments. I appreciate Trail Boss’s comments about non-alpine elevations above 3500 feet being potentially fragile camping areas due to lack of ground cover in coniferous areas. I am surprised by the claim from the High Peaks Advisory Committee that “Most of the pressure on the eastern High Peaks comes from campers rather than day hikers”. It would appear to me that the problems of trail erosion, alpine damage, and garbage are directly linked to the total number of hikers using the trails, and that the large majority of those hikers are day hikers. Trail Boss is right in saying that (individually) campers create extra pressure on the environment. Campers put serious pressure on the actual areas where they camp, especially in very popular official camping areas like Marcy Dam. But I would have thought that to be a highly localised problem, and one that is less serious than alpine degradation and trail erosion. My post, however, was about restrictions on “at large” camping. It seems to me that at large campers who obey the 150 foot rule are a small, low-impact group that are virtually invisible within the park. Does anyone have information or experience that would suggest otherwise? If you want to find garbage, you can spend all day combing High Peaks trails or head directly to a few designated campsites and save yourself a lot of walking. While surveying campsites for inclusion in OpenStreetMap, my travels exposed me to a lot of sloppy camping practices in the High Peaks. Privies are often used as garbage dumps (in and around the privy). Unlike the little bits of wrapper and tissue you find along a trail, privies attract food packaging in all its forms (plastic wrappers, mylar pouches, cans, etc; 'big-ticket' food items associated with camp-cooking). Plus it's sloppy camping practices that create habituated bears. Less frequently, you'll discover something High Peaks day-hikers don't do and that's leave behind large items like food, containers, and even camping equipment. Upon returning from our hike of Marcy, Skylight and Gray, a friend and I cleaned up discarded gear (a wall-tent and a pop-up tent plus canteens, bottles, etc) at Lake Arnold. We managed to compress the leftovers into the size of … a cooler! Unprepared to handle this kind of volume, we packed out whatever we could fit into our day-packs. 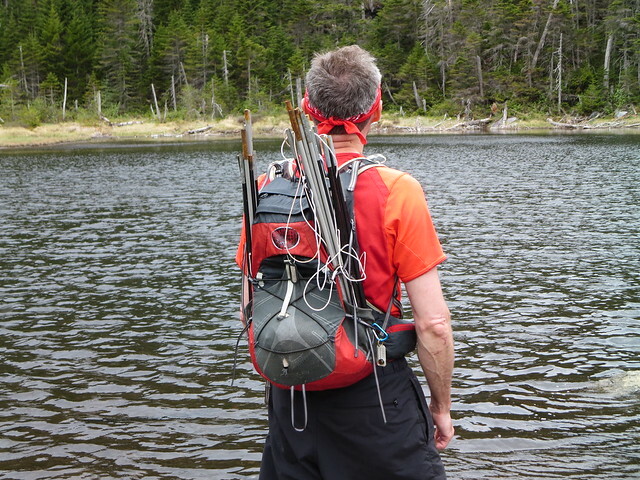 This is me with the wall-tent's discarded tent poles. Packing out the tent poles. Day-hikers are no saints but when campers sin, it's often not the kind a single Hail Mary will fix! You're a good man Taras! disk and campers may not camp in excess of 15 feet from such signs or disks. further than 15 feet from a camping disk throughout the HPWC. Does this really mean no more primitive camping except within 15 feet of designated sites? So I can drive 6-7 hours up to camp in the adirondacks, hike out 2,3,5 miles to a camping area, and not be able to camp because all spots are taken ? Or worse, having to camp near the nature freaks who are clueless about leave no trace camping or basic bear smellable knowledge. Last edited by IronMan; 09-06-2018 at 05:45 PM.. Yes, technically, but it is open to interpretation by a ranger. Take the tenting area around Feldspar Lean-to. It is a busy place, especially on a w/e. There is usually someone(s) who have put up their tent outside the 15' radius. If you are cutting down trees to make room for yourself, trenching around your tent, leaving litter, building a fire, etc., then you will probably get a ticket. If you are treating the area with respect and following LNT ethics, you should be ok. Now, tent near a "no camp" disk, we have a problem. A designated primitive campsite is one identified by a DEC permissive sign or disk and campers may not camp in excess of 15 feet from such signs or disks. It was included in a comprehensive, categorized list of all regulations and guidelines for the Eastern High Peaks Wilderness Area. To define proper camp locations, disperse use and limit adverse impacts to resources and other campers, a regulation will be adopted to prohibit camping further than 15 feet from a camping disk throughout the HPWC. The difference is that what was once a regulation exclusively for the Eastern HPWA will now apply throughout the new HPWA. The new HPWA is bigger and now includes the former Dix Mountain Wilderness Area. It means if you camp at a DEC designated campsite in the HPWA, you must be within 15 feet of the marker. Campers have been pitching tents more than 15 feet away thereby creating "suburban sprawl". What was originally two official designated sites becomes two sites plus many unofficial satellite sites. You can continue to primitive-camp in the HPWA (except in the newly renamed Central HPWA) provided you select a spot that is more than 150 feet away from lean-tos, trails, sources of water, designated campsites, DEC buildings, trailheads, parking lots, etc. and below 3500 feet elevation. With the addition of the Dix Mountain Wilderness Area in the east, the Eastern HPWA now becomes the Central HPWA. This is new … and an idea that's been gestating since the 1999 HPWA UMP. No more 'free-range' camping in the Central HPWA. So I can drive 6-7 hours up to camp in the adirondacks, hike out 2,3,5 miles to a camping area, and not be able to camp because all spots are taken ? Yes, if you intend to camp in the Central area during peak season. I don't know when the UMP's "Proposed Actions" will take effect. As far as I know, you can still primitive-camp in the Eastern HPWA (new Central HPWA). Best bet is to contact the DEC and ask when the Action comes into effect. I'm a day-hiker so this new 'no-free-range camping in Central' will not affect my plans. Last edited by Trail Boss; 09-06-2018 at 08:51 PM.. They're going to have to move some of their disks then. I can think of at least a few water access sites where the disk is near the water (for visibility, perhaps) but the camping area for that disk is way more than 15 feet back. Well I believe they had the same proposed plan, from 1999, for the corridor from roughly adirondack log to marcy dam to indian falls, ban all free range camping unless near the special disk, but never implemented it. Hopefully they take their time on this as well, there are a ton of action items. And besides, it's an awfully big woods out there, and they are already understaffed, ya know? :-) I think Dundee is right, they might just leave the people who know what they are doing alone for the most part. "And besides, it's an awfully big woods out there, and they are already understaffed, ya know? :-) I think Dundee is right, they might just leave the people who know what they are doing alone for the most part." So how do they tell the people who know what they are doing from the others? You obviously think you are above the regulations ya know? :-), entitled to your spot in the overcrowded "wilderness" just because you drove 6 or 7 hours. Maybe a permit, you get one per year? Do people who drive 14 hours take precedence over you? It's pretty clear who knows what they are doing out there, and who doesn't. And you know this, or you should. The basics of leave no trace are simple, and from my two trips out there this summer, it's very obvious that a large number of campers, and hikers, have no clue, or don't care. I witnessed people washing their hair using shampoo at the marcy dam creek, saw entire pots of dinner dumped in outhouses, looked in the creek at indian falls to see a bunch of macaroni in it just sitting there at the bottom of the creek, ducked off the trail to take a leak and saw countless toilet paper blooms, the list goes on and on. And this is what I saw in two short camping trips. You have bears unafraid and harassing people, or worse being euthanized because of stupid people. They are setting up these regulations, because people don't care or are ignorant. And the percentage of campers who can camp and leave without leaving any sign there were there, or even make the place cleaner than when they found it, are being screwed.